The Crochetville Flower Swap began March 1st and is drawing to a close on April 30th. It has been graciously hosted by Julie through Crochetville. I want to shout out a big thank you to Marvie and Renee, two of my swap partners, for the lovely packages they sent to me! 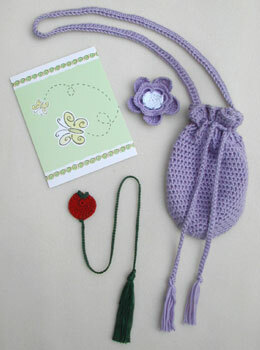 From Marvie, a purple drawstring bag with a purple and white flower that can be used on the bag or eslewhere, a tomato bookmark, and a note. Thank you, Marvie! 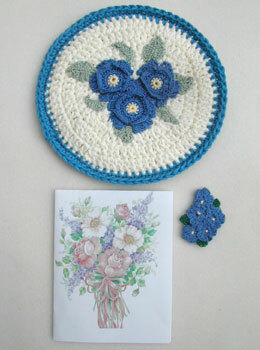 From Renee, a cotton potholder with thread flowers, a flower magnet, and a note. Thank you, Renee! I’m still finishing up the flowers I made for my swap partners, but I’ll be showing them here soon! Everything is lovely…the blue flowers and that purple bag are great! Hey Donna! I love those flowers!! I was looking for a link to your e-mail… couldn’t find it. Write me? I have a button question for you!! Hi you… :o) that’s really nice stuff! If you haven’t taken me off the blogs webring…please don’t. I’m reconsidering my rash and foolish spur of the moment non-decision…I miss you guys! that magnet is great!!! and the bookmark is just cute cute cute!!! Those are so nice! Great job Renee & Marvie. The tomatoe is too cute! Wow … those are soooo lovely! *Sigh* Donna, I think I have taken too long a break from the 63-square project … I’ll be back to it during the coming weekend! You’ve got lovely stuff! And the patchwork comfortghan is wow…lotsa work there.